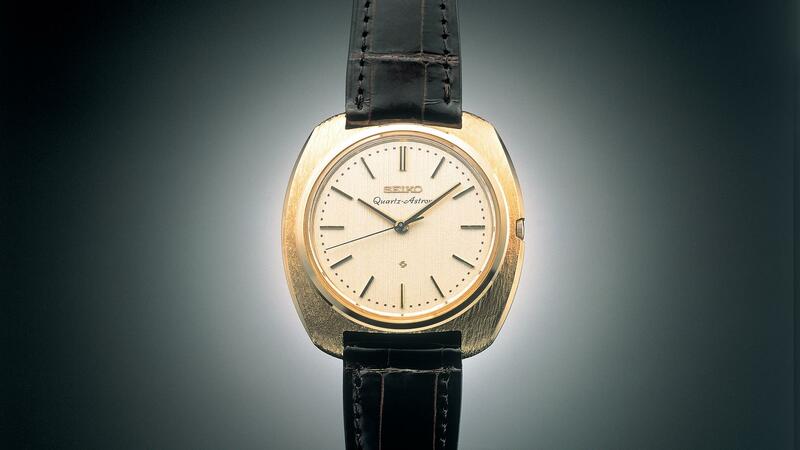 The quartz watch, developed in 1969, revolutionized the conventional concept of watches. This is a watch that has a crystal oscillator at its core for accuracy. The crystalline body of a crystal cut to a fixed shape has a characteristic to generate steady vibration if voltage is applied to it. Through the ages, the idea has existed that this crystal-specific electrical property is used for a crystal oscillator to be the standard of timekeeping accuracy of watches. However, to take advantage of quartz crystal, whose excellence had been demonstrated in terms of accuracy, in a small world "watch," there were many barriers that had to be overcome. contributed to development of present day quartz watches. Released on December 25, 1969, this watch revolutionized the world of time. It was the "Seiko Quartz ASTRON." The quartz frequency at that time was 8192 Hz, one-fourth the frequency today. One of the major features of the watch was its step motion second by mounting an open step motor, which became the symbol of quartz watches later on.